Type K Thermocouple Extension Cable for connecting thermocouples to instruments etc. Two 7/0.2 size conductors, with PVC insulated inner sheath and PVC insulated outer sheath. Class 2 thermocouple connecting cable tolerance. IEC colour coded (green outer & postive, white negative). 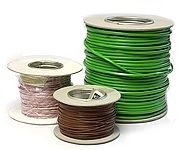 A wider range of thermocouple cable is also available from TMS, including other insulation materials, conduct size, and reel calibration. For longer or custom lengths please contact us with your requirements for a quote.